This move was based upon an amendment to the Civil Aviation Act. 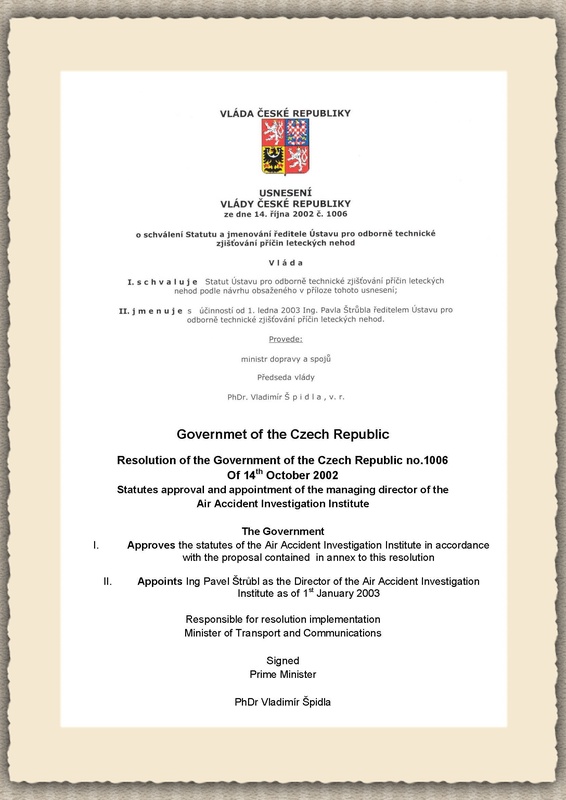 The foundation of this independent authority reflected an extensive programme of international organisations aiming to increase the safety of civil aviation, which was also one of the criteria of the Czech Republic to join the European Union. The basic EC requirements were stipulated in 94/56/EC Council Directive of 21/11/1994 which provides basic principles for investigation of accidents and incidents in civil aviation. In order to achieve the standards required by the EU, an Act No.258/2002 Coll. came into force amending Act 49/1997 Coll., and amendment and supplement of Act 455/1991 Coll. on business (Trade Act) as amended (further referred to as Civil Aviation Act). The Institute has been established pursuant to § 55a Art. (1) of the Civil Aviation Act. The Government of the Czech Republic by its resolution No.1006 of October 14, 2002 approved the Institue´s statutes and appointed Ing Pavel Štrůbl as the Managing Director. The Czech name of AAII was changed to Ústav pro odborné zjišťování příčin leteckých nehod as of 1st July 2006. This change was based on an amendment to civil aviation act. Standards and recommended practices for professional investigation into causes of aircraft accidents were first adopted by Council on 11 April 1951 under the provisions of Article 37 of the Convention on International Civil Aviation (Chicago, 1944) and marked as Annex 13 to the Convention.